Easy, standalone use: the devices can be used without any preinstalled apps. 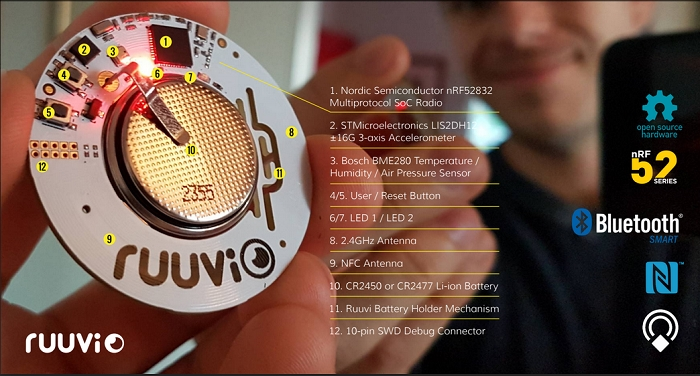 Eddystone certified: RuuviTag is checked for full Eddystone support by Google engineers. Arduino compatible: the software is compatible with Arduino's recently announced IoT platform, Arduino Primo. Multiple Sensors: to measure temperature, relative humidity, air pressure, altitude and acceleration. Bluetooth 5 ready: the new Bluetooth release quadruples range, doubles speed, increases data broadcasting capacity by 800% and brings Bluetooth mesh networking to reality. 100% OpenSource (both hardware and software). A calculated battery lifetime of up to 10 years. Lauri Jämsä, CEO of Ruuvi Innovations said - RuuviTag is IoT for everyone. There are many traditional beacon providers out there but the market needs more opensource IoT sensor solutions. That’s why they have released all their hardware design and software codes to the public. During the design process many worldleading IoT pioneers gave valuable feedback to their development team. They’re thankful to Nordic Semiconductor and Google’s Physical Web team for their support to this project. 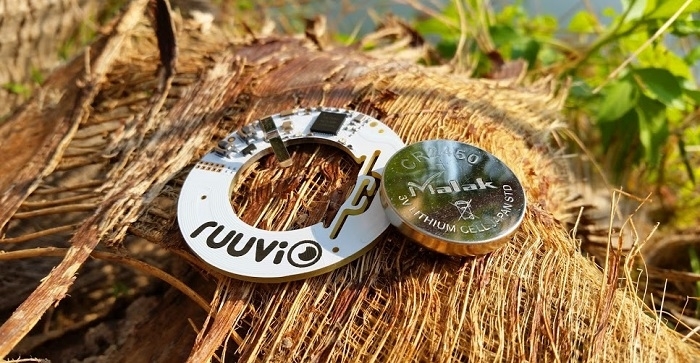 The RuuviTag is a sensor beacon that can be used for several different purposes whose battery life lasts up to 10 years. One of the most impressive features of this beacon is its superior antenna design. Bluetooth’s maximum range is commonly known to be 100 meters. But its openair range has been proven to reach over 1 kilometer thus expanding the range 10 times the average expectation. The tag can act as a standard Eddystone or iBeacon proximity beacon but it has the potential to be so much more. By having a way to measure temperature, humidity, air pressure and acceleration it’s possible to cover several use cases. It can be used as a remote weather station with readings that can be pulled up on your mobile phone without pre-installing a mobile app of any kind. Can be attached to to your bicycle so you can be notified if someone moves it or tell it to broadcast a Physical Web address. There are endless possibilities for its set up. No programming tools or advanced technical knowledge is required. But, because everything is open-source, the opportunities are limitless. This devices will be commercially available in Q4 2016 at selected webstores.